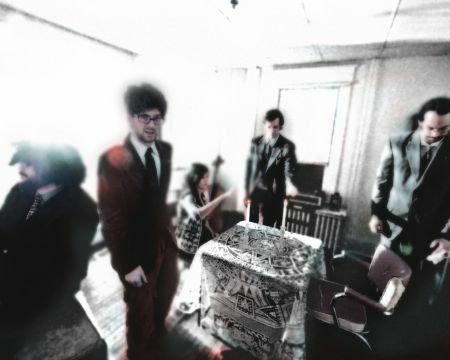 All of the band members chime in with wild and wonderful replies about their mind-bending avant-garde style. Heya Doug, Camellia, Benji, Jason, and Doug #2! Before I grill you with hard-hitting, hot topic, button-pushing questions, could you please introduce yourselves and comment on the differences between the two Dougs? Doug Cheatwood. I'm Doug. I'm medium sized and the singer. As opposed to tall Doug, who plays drums and sampler. Doug Shelor: He stands in the front. I sit in the back. Camellia Delk: I'm Camellia, I play synth teeths. Doug Cheatwood runs around in the front like a looney tune w/ a utility light while Doug Shelor is stationary in the back and flails his arms around lots, like a mad man in distress. Same. Yet. Different. Jason Wellz: I'm Jason. I'm in charge of bass and pure moods. Camellia: Like... when you get exorcised or get pied in the face? Your second musical genre-slaying album “VampiresAre Real And Palpable” came out mid-June on This Will Be Our Summer Records. What has the reception to it been like? Cheatwood: So far so good. We have a couple videos that we are winding up, and the press is still in queue, but the people who have heard it have said they enjoy it. So that's gratifying. Wellz: It's that 1 out of 10 you really need to worry about. One reviewer said it continues to spread like a well-executed piece of vandalism. I'm way into that... Let’s start a Cult! 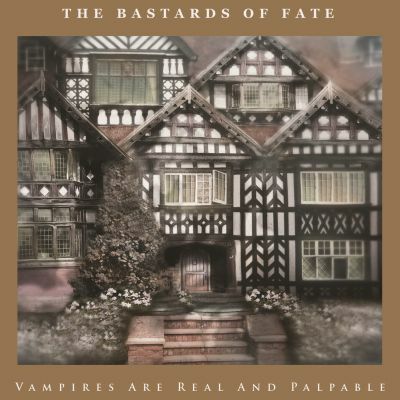 While your music has been tagged as being avant-garde, the tunes on “Vampires Are Real And Palpable” are eminently listenable (albeit disconcerting at times!). Who is the songwriter in the band or do you all contribute parts to the whole? Cheatwood: I write the words and often have a chord progression, or maybe just an idea about the mood. The arrangements have become more and more democratic as the band has progressed. I feel like we each contribute something crucial to the whole. Cheatwood: A lot of inside jokes. Wellz will start doing something and I’ll think that’s pretty weird. Then I’ll have to respond to it in some way for it to make sense to me. Then someone will respond to me. It becomes this weird circular thing. Where/how do you acquire your found sounds and how do you incorporate them into your tunes? Cheatwood: I have a pretty big weird sound collection on my computer. But if I'm ever looking for something specific I will usually just search Youtube. Shelor: Sometimes there is a specific sound in mind for a specific time in the song. Sometimes a specific sound in mind for a song in general. Sometimes we just try things out, and if anyone else in the band laughs at it, it usually stays. Camellia: Remember that water bottle ya'll used for the 1st album... That was gross/awesome. Benji: The slappy latex gloves... Sometimes we consciously (or unconsciously) agree to rip off a particular genre(s), then the arrangement may develop around that, but yeah, sometimes it's just one big inside joke. With no punchline. I’d like to take a closer look at the creation of your song “Go No Further”. It’s a freaky-deaky tuneful pastiche of classic pop melody, 1950s TV show theme songs, scary spoken word, industrial beats, low-key laser zips, and the insightful lyrics “You got no further than the street you grew up on”. How did you stitch this one together, Dr.Frankenstein(s)? Shelor: Cheatwood is a master/disciple/prophet (?) of classic pop and came to the rest of the band and asked to emote to a 1970's TV theme song. Wellz and I were best boy and second grip (respectively) for the British TV show Rhubarb and Custard, so we knew what to do. Benji's main instrument is a laser, and Camellia owns more Skinny Puppy tee shirts then anyone. Cheatwood: I wrote the chorus on the street that I grew up on. I'm not joking. I was walking past my childhood house, which is near where I live now, and thought of the chorus, and wrote it on a receipt from 7-11. The song is about being a bully, and how when you grow up you learn to be cruel and manipulative in ways that are less overt but just as damaging. You learn to hide your worst impulses from yourself and others, while still acting them out in less direct ways. That's why the song sounds so cheerful. Wellz: WTF is a best boy anyway? I just thought we were covering that obscure TV show from the 70's called The Famowitz. We are a cover band, right guys?.... Guys? You are known for putting on a strong live show. I’m wondering how much your songs morph from the studio to the stage setting. As a 5-piece and with such multi-faceted tunes, how do you stay on track live? Benji: By not drinking home-brew before we play. Wellz: Cue that Lowe Stokes and The New Georgians song.... Haha. I think the live show is the 6th member of the band. Sometimes it really is a psycho-drama up on stage and it definitely changes the songs. Shelor: We play the songs in front of an audience a bunch of times before recording them. Then tons of times after. Each time we do it is under a whole new set of circumstances. We're fortunate to play in a group of flexible performers that merely need the roughest frame work of a song to hold onto. We're not scared to ride roller coasters with the lap bars up if we're all on the same train. Cheatwood: One thing that I think helps us stay on track live is that I tend to sing the songs almost exactly the same way every time. I don't get too spontaneous, musically. I like scripts and rituals. So the rest of the band can use that as a backbone. The live show probably sounds a lot closer to the recording than you would think. You formed in 2006, but only released your debut album, “Who’s A Fuzzy Buddy?”, in 2012. What songs were you playing at your formation and did they all make it on to your debut? Wellz: At the beginning we were doing rearrangements of Cheatwood's previous songs. A stack of songs came and went in the following years so not everything made it on “…Fuzzy Buddy”.” Like the greatest cover of Pearl Jam's “Jeremy” ever. Cheatwood: No, we talked about doing that one. The one we actually did was “From A Distance” made famous by Bette Midler. Is the following an accurate description of what you are aiming for? : A deconstruction and reconstruction of pop structure. Shelor: That's pretty highbrow. Should we admit that we were really trying to recreate the vibe of Huey Lewis' “SPORTS”? Cheatwood: My brow can never be high enough... and I think that's a fairly accurate description of what we ended up with. But it would be a mistake to say that we sat down and aimed to do that. This is art, so it's all about intuition. And post-modernism has been a thing for going on 40 years now. I certainly grew up loving pastiche, and artwork that dismantled value systems instead of reinforcing them. The process was less cerebral, and more gut feeling. The deluxe edition of “Vampires Are Real And Palpable” comes with a Vampire Survival Kit. Are garlic mints included? Shelor: It's worth the money to find out. Cheatwood: I think garlic mint is an oxymoron. Wellz: We really need a well written EULA before people start banishing” their neighbors and friends. Despite your album title, I take it that the vampires you reference are the ones that we encounter in our daily lives - the suckers that drain our time, energy, and thoughts - and also what exists in our minds that can sometimes stymie our good intentions and goodwill. Or, ummm, do you mean literally that Vlad and his buddies do roam the earth? Shelor: Banish her! She knows too much! Wellz: HAHA. The former though the latter is a possibility as well. I’m not sure if you’re all from Roanoke, VA, but the (hi)story about the lost colony from that location is such a chilling and gripping mystery. Does that type of history inform your music and/or your outlook? Cheatwood: We live in the Blue Ridge Mountains, in Virginia. The Roanoke River runs from where we are down to the Lost Colony. And yeah, sometimes you feel isolated here, and sometimes it is spooky, especially at night. Fortunately the city of Roanoke erected an 80 foot tall electronic Christmas decoration on Mill Mountain a hundred years ago for the purpose of dispelling dread. It's a giant white neon star that they change red when there's a drunk driving fatality. What is on the horizon for you all as The Bastards of Fate? Touring? A video? Hunting down vampires? Watching movies about vampires? What is your favorite vampire-themed movie? Mine are Near Dark, the original Let the Right One In, and Bram Stoker’s Dracula for the cinematography, costumes, and décor. Wellz: We are working on new songs and the next record. Videos are being finished up currently and shows and touring are in the pipeline. I love Near Dark, Bleeders, and Subspecies. Cheatwood: LTROI is amazing! That movie comes closer than any other I can think of to portraying what I understand vampirism to be. I think most popular culture about vampires tends to focus on the surface cheese while missing what actually makes vampires scary, which is that you invite them in. It's your weakness that allows a vampire to live, and in a world where everyone is looking for a clear-cut, black and white moral framework to work from - a framework where abuser and abused are easily separated - vampires reveal the duplicity of will in us all. There's a short story called “Replacements" by Lisa Tuttle that also hits the nail on the head. I have to admit, I am also really entertained by my memory of Blade. Isn't there a scene where he is interrogating a pale, sewer-dwelling blob by locking it in a tanning booth? That's pretty great, right? Camellia: Fearless Vampire Killers, Fright Night, LTROI and The Lost Boys. Benji: I'm kinda surprised that Billy Corgan never got a stake through the heart during the “Adore” phase. The World is a vampire, y'all.